We write in response to the public reports submitted by U.S. companies in compliance with the Burma Responsible Investment Reporting Requirements (“Reporting Requirements”) issued by the US Department of State. Composed of 60 eminent jurists and lawyers from all regions of the world, the International Commission of Jurists promotes and protects human rights through the Rule of Law, by using its unique legal expertise to develop and strengthen national and international justice systems. The ICJ appreciates the U.S. government’s efforts to promote responsible investment in Myanmar and to ensure that U.S. companies are responsibly managing their business activity in the country. We support your decision to continue to sanction businesses under the National Emergencies Act barring U.S. individuals and companies from investing or doing business with people linked to human rights abuses under the army’s military rule. The ICJ urges caution over the United State’s recent decision to allow for an exception to the sanctions regime for people who have already been documented as having links to the military regime and implicated in human rights violations.1 This caution reflects the ICJ’s work with the Directorate of Investment and Company Administration, the Attorney General’s Office, and the Union Supreme Court of Myanmar, as well as civil society organizations, to strengthen and support local efforts at ensuring that investment protects and promotes the rule of law, human rights and the environment. In this regard, the ICJ has visited and researched on the human rights and environmental impacts of investments in the 3 Special Economic Zones (“SEZ”), as well as other non- SEZ sites, in the country. We believe that future reporting must be strengthened to ensure that U.S. companies comply with the Reporting Requirements, conduct due diligence and disclose adequate information transparently about the impact of their business practices on human rights in Myanmar. This is especially crucial in light of significant reporting gaps in July 2013. Failure to strengthen the requirements will undermine the goal of the Reporting Requirement to be a tool for promoting investment that reinforces those political and economic reforms that are compliant with the rule of law and human rights and help to empower civil society. National Land Use Policy Consultation in Nay Pyi Taw: A positive step or a distraction? While the government should be commended for holding open consultation and taking on board many of the comments from civil society, the consultation’s location in Nay Pyi Taw is prohibitive to most civil society organizations (CSOs). In fact, if it was not for the diligent organization of buses and accommodation by Land Core Group, headed by U Shwe Thein and facilitated by Glen Hunt, the consultation would have been more like a intergovernmental discussion. U Shwe Thein, a veteran of these types of consultancies and one of its key coordinators for civil society explained that he was impressed by the genuine open discussion. He noted that the different sides were closer together than before and that the government seemed to listen to most of what civil society put forward. This consultation is a model of good practice in a country like Myanmar, where five years ago this type of engagement would be unthinkable. Although there are many problems with the document and the consolation, that it exists and has happened is positive. There were lively and heated debates in all five groups. During the group presentations summarising the discussions, many in civil society noted that key issues had not yet been addressed. It was clear that civil society’s concern over ‘market-based solutions’ and ‘contract farming’ will not be heeded and will be in the final draft in some form. There was some confusion noted over translations of terms, including the word ‘treaty.’ Many CSOs representing ethnic groups worried that customary land rights and dispute resolution practices were not adequately addressed. It should be noted that both sides seemed to agree that the principle of Free Prior and Informed Consent (FPIC) would be applied to the Land Use Policy. I am curious to see how this will be implemented in practice. Relevant laws, rules and procedures shall be amended, repealed and newly enacted, if necessary to conform to the objectives, basic principles, practices and instructions in this policy. (a) Public participation management process and fair, equitable and systematic procedures shall be defined; (b) Shall define measures to prevent and control corruption, and misuse of power, by assigning qualified persons capable of carrying out matters relating to land use in a fair and correct manner in accordance with law; (c) Shall describe effective, consistent and fair valuation system when providing compensation and relocation for people affected by land acquisitions; (d) Shall conduct necessary rehabilitation, even though compensation and relocation has already been carried under sub-paragraph (c); (e) Shall define the time period for conducting matters defined in sub- paragraph (c) and (d);(f) If the affected person wants to invest in the project, it shall be allowed. 79. (a) For the harmonization of all existing land laws in Myanmar, a new National Land Law shall be drafted and enacted based on this land use policy; (b)In drafting the national land law, the participatory consultation process contained in this land use policy as the procedural method; (c) In drafting the national land law, consultation process and major processes shall be carried out as follows: (i) informing the purpose and process of drafting the national land law to the public, relevant government departments and organizations and the stakeholders by suitable manners; (ii) carrying out comprehensively to scrutinize and give advice by the relevant stakeholders including the media and the public after drafting the draft national land law on which comments would be sought by studying the experiences of international countries and other regional countries and based on the salient situations of Myanmar, problems encountered, interests of the users of land and other natural resources in the country; (iii) holding the national level workshop relating to the draft land law; (iv) submission to the Pyidaungsu Hluttaw after finalizing the draft national land law. While these principles are welcomed commitments on the part of the government many CSOs asked for clearer definitions of terms. The general response from the government was that more detail was to come in the new Land Laws. CSOs expressed concern that new law was being drafted simultaneously, with much less regard for civil society concerns. For this reason, they advocated for as much detail as possible to be included in the policy while the government preferred a more general, briefer document arguing that the details will be included in the law. In the area of dispute resolution, there is further confusion. Will the line ministries that implement the 34 laws use the new NLUP to decide land disputes brought under their purview? The NLUP will create a National Land Use Council that will then, in turn, create work committees as well as Region or State Land Use Committees. Region and State Governments will also create Self-Administered Zone, District and Township, Village or Ward Land Use Committees. How will these new Committees interact with the myriad existing Committees overseeing various land laws? It certainly a step forward for Myanmar when the government engages in a long consultation process and amends numerous drafts to reflect many of civil society’s concerns. If nothing else, the NLUP will serve as an important guideline for Civil Society to use in its advocacy in Myanmar. It remains to be seen how the final draft will look and how its provisions will frame the drafting of much needed, consolidated land law. One thing is certain, the irony of holding a land policy consultation in Nay Pyi Taw – itself not exactly a model of participatory, sustainable land use – was not lost on the participants. The ICJ today organized a diplomatic dialogue, in advance of the Universal Periodic Review (UPR), with ambassadors and high-level diplomatic representatives, to share the state of human rights in Myanmar. The event also aimed at working on specific, actionable recommendations to the government to effectively address human rights violations and provide redress. With an improper regulatory regime for investment and environmental protection, and with investment coming into a legal vacuum in Myanmar, economic development has risked undermining human rights protection and access to remedy, especially impacting on economic, social and cultural rights. In turn, this situation has created conditions for further human rights abuses in Myanmar. In its UPR stakeholder submission, the ICJ drew the attention of the Human Rights Council’s (HRC) Working Group on the UPR, and that of the HRC itself, to the organization’s concerns about the independence of the judiciary and legal profession, the lack of legislation adequately protecting human rights and the environment, discriminatory laws targeting women and minorities, and the writ of habeas corpus in Myanmar. While it is the judiciary’s responsibility to provide remedy for human rights abuses and bring perpetrators to justice, Myanmar’s judiciary faces continued challenges to assert its independence from the other branches of government that interfere and influence its role. A severe lack of resources has led to structural problems, crippling the legal profession and leaving several judges unfamiliar with court procedures and jurisprudence. The quartet of laws to “protect race and religion” – clearly discriminatory of religious and gender grounds – are hastily being signed into law, even though they fail to accord with international human rights principles, including Myanmar’s legal obligations as a state party to the CEDAW and CRC. The 23rd session of the United Nations Working Group will meet to next review Myanmar on 6 November 2015. The diplomatic dialogue aimed to provide the international human rights organizations with an opportunity to reiterate their key UPR recommendations and provide any relevant updates since the stakeholder submissions; and for all participants to discuss plans of multilateral lobbying ahead of the UPR Working Group session in Geneva. Danish Ambassador Peter Lysholt-Hansen hosted the event at the Nordic House. Members of the diplomatic community who attended the dialogue included those from USA, the EU, Canada, Denmark, Norway, Sweden, Germany, France, Vietnam, Malaysia and Australia. The ICJ was joined in a panel by other international human rights organizations – the International Bar Association, Human Rights Watch, and Amnesty International – who all presented on various pressing human rights issues confronting Myanmar. ICJ’s diplomatic dialogue will complement a similar event to be held in Yangon later this year, which will be organized by the UPR-Info with local non-governmental organizations. The ICJ’s UPR stakeholder submission for Myanmar can be found here. A briefer on ICJ’s specific, actionable recommendations to the HRC, and the Working Group can be found here. The ICJ conducted a two-day workshop on “Business and Human Rights” in Kyauk Phyu, Rakhine State on 30-31 May. The event was attended by 40 participants representing civil society organizations in Sittwe, Kyauk Phyu, Ann and Ponna Kyaunn. It also included members from the township and district courts, township police force and members of parliament, focused on investment in Rakhine state in the absence of credible and transparent mechanisms to prevent human rights abuses. The workshop occurred against the backdrop of myriad longstanding human rights issues in Rakhine State, including the humanitarian crisis confronting the state’s Rohingya population. The State has also witnessed ongoing government repression of the State’s ethnic Rakhine population in response to demands for autonomy and their opposition to unregulated development of the State’s ample natural resources, including extensive gas deposits, at the expense of their livelihoods and rights. The development of gas fields in the State has been fraught with human rights violations, including of forced labour and forced eviction of thousands of farmers from their lands. As discussed during the workshop, since Myanmar’s relative opening up, the government has continued to invite and approve of foreign investors to develop resource extraction projects in Rakhine State, while locals resist the potential harmful effects of such projects on their livelihoods, properties and environment. In 2013, hundreds of villagers protested against the adverse impacts of the Shwe gas pipeline construction – a large scale natural gas project developed by Daewoo International of South Korea in a joint venture with Myanmar Oil and Gas Enterprise. Daewoo has once again ventured into Rakhine State, proposing a coal power plant in Kyaukphyu township, that could have adverse effects on the economic and environmental landscapes in local communities. 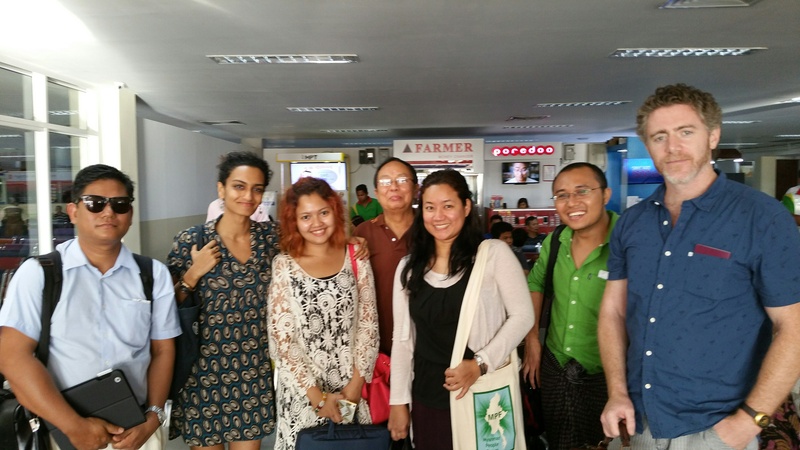 During ICJ’s previous trips to Sittwe and Kyaukphyu, local civil society activists had asked for information on responsible investment and national and international standards relating to displacement, land confiscations, and environmental and social impact assessments. In the first day of the workshop, U Kyaw Min San, ICJ’S National Legal Adviser, led the discussion on fundamental citizen rights guaranteed in Myanmar legislation as well as an analysis of the land laws in Myanmar. Daniel Aguirre, ICJ’s International Legal Adviser, gave an overview of international human rights law and the role of States and business corporations in protecting and respecting economic, social and cultural rights. Vani Sathisan, ICJ’s International Legal Adviser, provided a legal analysis of Myanmar’s law on Special Economic Zones (SEZ), highlighting how the law fails to guarantee the protection of human rights and the environment while providing tax reliefs and exemptions, as well as land leases, to win over investors and developers. On the second day, Daw Tin Tin Wai, Private Sector Policy Officer from Oxfam GB and a Campaign Officer from EarthRights International shared their experiences from Dawei SEZ and Thilawa SEZ, respectively. They shared that lack of consultations with local communities and large-scale land confiscations through intimidation and threats occurring in the two SEZs reflected flaws in the government and judiciary to protect human rights and provide for access to remedy. The workshop included a group discussion among the participants focusing on the role of local and international non-governmental organizations in Kyauk Phyu, Ponna Kyunn and Sittwe, the current situation of Kyauk Phyu SEZ and Ponna Kyunn industry zone and land issues related to such development projects. Hayman Oo, ICJ’s Legal Researcher, facilitated the discussion, which served to highlight the specific themes around which the CSOs were organizing their advocacy and research. At the closing dinner, U Kyaw Min San extended the ICJ’s appreciation to all the local CSOs for their participation and active engagement, and reiterated the ICJ’s support to work with community-driven organizations to work on recommendations to the government and businesses on transparency, prior consent and consultation, and compensations, and to push for a more rights-compliant approach to investments in Kyaukphyu. The ICJ has released a statement on the humanitarian crisis in the Andaman sea. It includes specific recommendations for the government of Myanmar. It explains that Myanmar plays a critical role in the regional efforts addressing the current crisis. It is clear that discriminatory policies and actions in Myanmar have significantly contributed to this regional humanitarian crisis, the ICJ says. The ICJ adds that the Rohingya are forced to flee their homes because of ethnic conflict and the policies of the Myanmar government. “The government has persecuted the Rohingya, refused to extend basic citizenship rights to them and in fact has recently passed legislation to entrench discrimination against the Rohingya such as the Protection of Race and Religion laws,” said Zarifi. “These are some of the so-called ‘root causes’ that have displaced thousands within Rakhine State and driven the Rohingya to the sea and to the territory of neighboring countries. It is no longer possible to cite ‘sovereignty’ as an excuse for silencing regional discussions about these serious human rights concerns,” he added. The ICJ has called on Myanmar to scrap laws that discriminate against minorities and to actively prosecute acts of violence fuelled by discrimination as well as crimes of hate speech. The ICJ has also urged Myanmar to undertake every effort to improve basic living conditions for the Rohingya and Arrakhanese population in Rakhine State by enhancing respect for and protection of their economic, social, and cultural rights. The ICJ today condemned the conviction of six human rights defenders after an unfair trial lasting less than five minutes. The six were charged in connection with their participation in a peaceful demonstration against the fatal shooting of a protestor in Letpadaung. They were sentenced to four years and four months in prison. “Under both international and Myanmar law, a fair trial means independent judges, the need for evidence of guilt beyond a reasonable doubt, and due process. All of these requirements were ignored in the case of these accused, who must be immediately and unconditionally released,” said Sam Zarifi, the ICJ’s Regional Director for Asia and the Pacific. “Instead of prosecuting peaceful protestors, the Myanmar government must hold those responsible for the killing in Letpadaung accountable and provide justice,” he added. The ICJ attended today’s hearing at the Yangon Dagon Township Court of Daw Naw Ohn Hla, Daw Sein Htwe, U Nay Myo Zin, Ko Tin Htut Paing, Daw Lay Lay @ Daw San San Win and U Than Swe, who were sentenced for violating Article 18 of the Peaceful Assembly and Peaceful Procession Law, as well as a series of offences under the Penal Code. These offences include assaulting or preventing a public servant from the discharge of his duty (Section 353); rioting (Section 147); publishing or circulating information which may cause public fear or alarm and may incite persons to commit offences “against the State or against the public tranquility” (Section 505(b)). It is unclear whether an appeal will be filed, but the ICJ understands that the accused’s appeal in this case would be highly unlikely to succeed. History to repeat itself in Burma’s newest Special Economic Zone? “We don’t want electricity when there is no rice to cook in the pot. Without our land, we have no job, and no food,” a villager from Pyai Sate Kay village told us during our recent trip to the Kyaukphyu Special Economic Zone (SEZ). After several days of speaking with villagers and civil society organizations (CSOs), it became clear that the newest SEZ in Burma (Myanmar) – Kyaukphyu, an island off strife-ridden Rakhine State – is displacing local communities without proper compensation and accountability for loss of land and livelihoods. CSOs in Kyaukphyu expressed concern about inadequate consultation, compensation and a lack of accountability for human rights violations in the context of forced evictions – all common complaints at other SEZs in Burma. Kyaukphyu: History to repeat itself in Burma’s newest Special Economic Zone?